Thieves often target automated teller machines for an easy payday. Some make use of complicated gadgets and technology to siphon off funds from unsuspecting card holders. Some who are lacking in technical know-how do it the hard way by physically tearing off the machine off the wall/ground and opening it somewhere else. And then there's the man from Marikina City who was caught trying to steal cash from a machine using an aluminum plate covered with jackfruit sap. Vivencio Cruel was trying to steal money from a bank ATM in Marikina when he was apprehended and then arrested by the Marikina City Police. Through a CCTV camera installed alongside the machine, employees of the bank saw Cruel doing his unique modus operandi. The employees called the police who quickly responded and arrested the man. Cruel was brought to the Marikina City Police Station and is currently being kept at a cell there. 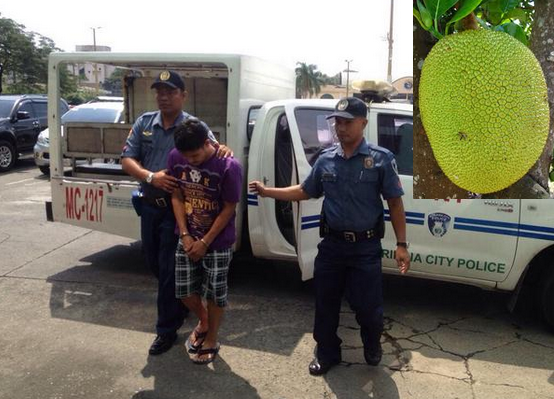 According to police investigation, Cruel and his companion who has been identified as Erwin Bantolome make use of a strip of aluminum covered with jackfruit sap in their modus operandi. They would measure the cash dispenser of a teller machine, cut a strip of aluminum of the right length and width, and stick it somewhere within the cash dispenser. If an unsuspecting person withdraws money, the sticky sap will catch the cash that's supposed to go out of the dispenser. The account of the person will register a withdrawal but nothing will come out of the dispenser. The bank launched their own investigation after receiving several complaints from their customers that cash aren't being dispensed by the teller machine although their accounts are credited with their withdrawals. That's when they saw Cruel and his modus operandi. Police investigation further showed that Cruel and his companion would sometimes leave the strip of aluminum in a teller machine for days before returning to collect their take. Jackfruit sap can retain their stickiness for long periods of time. They don't dry out that quickly so that's probably why it's the sap of choice for the two thieves. With that said, always be careful and vigilant when withdrawing money from any teller machine. If money doesn't come out of the dispenser, get the attention of the bank immediately. Get the attention of the security and if no security is around, call the bank's support hotline.